The world’s literati know that some of the greatest writers have also been some of the greatest satirists. Jane Austen and Jonathan Swift come to mind. So does Kurt Vonnegut. But this year marks the semi-centennial of one particular master of sarcasm and satire. And that would be the inimitable Walker Percy. 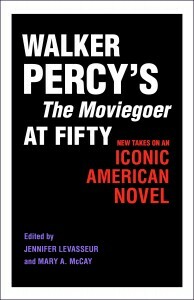 Percy’s first and most widely acclaimed novel, The Moviegoer, won the National Book Award and has been ranked as one of the “100 Best English-language Novels from 1923-2005” and again as one of the “hundred best English-language novels of the twentieth century” by Time Magazine and Modern Library, respectively (1)(2). To celebrate it’s fiftieth birthday, LSU Press is publishing a collection of essays that draw on the various fields of philosophy, theology, media studies, and music, literature, and film studies to illuminate The Moviegoer’s impact on the world today. We are particularly excited about this book because one of the authors contained in its pages is also a contributor to this journal. Professor Read Schuchardt of Wheaton College has coauthored with Jonathan Potter an essay entitled “Binx at the Movies, Percy at Play: The Moviegoer’s Cinematic References Revisited.” It is an incredibly useful and practical essay that anyone who is (a) interested in Walker Percy and (b) younger than 35 should read. If you were wishing there was a Sparknotes to The Moviegoer to help make sense of its many allusions, then you can start thanking the Lord now, because here it is.